Mayor Jerry Sanders and Qualcomm cofounder Irwin Jacobs appeared at a Rules Committee meeting on Wednesday in support of a proposal to remove traffic from the Plaza de Panama in Balboa Park. Both Sanders and Jacobs touted the project and encouraged committee members to allow the mayor's office to execute a memorandum of understanding (MOU) with the Plaza de Panama committee, the nonprofit group responsible for funding the project. "The next generation of San Diegans will scratch their heads wondering how anyone could have opposed this simple and elegant plan," Sanders told committee members. Sanders is correct; many people do oppose the plan, especially the alternative to build a bypass road off the Cabrillo Bridge. Critics say the road will destroy a natural resource and endanger pedestrians and cyclists. After hours of public testimony, some councilmembers also expressed concern for the bypass road. They committee moved the item to the full council but with direction to city staff to look at closing Cabrillo Bridge to traffic temporarily while the process continues. monaghan June 8, 2011 @ 4:54 p.m. It's pretty extreme to propose a major assault on Balboa Park's western entrance landscape and architecture as the necessary price to get rid of a few hundred cars from the Plaza in front of the Museum of Art. 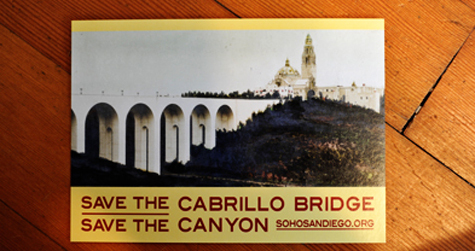 Everyone wants to open up the Plaza to people-only, but a roadway by-pass of the Cabrillo Bridge into a visible canyon ending at an above-ground parking garage near the Alcazar Garden? No way. Whatever happened to just banning cars from the area to be reclaimed for pedestrians and re-landscaping with tiles, pavers, fountains, whatever -- and then figuring out how to run a shuttle of some sort -- buses, trolley on wheels, pedicabs, vintage taxis, horses and buggies, whatever -- to get people from distant parking lots to the attractions in that section of the Park? Let's keep the plan simple and workable, doing the least damage possible to the Park itself, and especially not compromising that beautiful Bridge and adjacent Garden. Any good traffic engineer can figure out the rest. Visduh June 8, 2011 @ 8:49 p.m.
You see, monaghan, that your solution isn't grandiose, expensive and sweeping. The big bucks types, such as KFC Sanders and even bigger bucks Irwin Jacobs, cannot abide a simple, low impact and low-tech solution. They both want to build a pyramid to their vision, and that's the current approach. Although I'm an outtatown type from north of Miramar Road, I do know that park. Banning cars from an area they should have never occupied is not a big deal. You just do it, and arrange a means to offer visitors a way to get into that area easily. That would be simple, but when did these last few city administrations want anything simple? No, let's build a pyramid instead. Twister June 9, 2011 @ 6:54 p.m. It's not their money, but it is a neat way of tranferring it from the pockets of the poor and middle-class (what's left of the latter) to the bank accounts of the power-structure's good ol' boys and gals. After all, that's what government contracts are for . . .